Guitar enthusiasts love to talk about tonewood. Whether it’s online forums or the counter of the local music shop, conversations usually revolve around the beauty of the grain or the resonant properties of different wood species. Rarely do the words sustainability or scarcity come up. These terms, however, are now central to the lexicon of the guitar industry. Reserves of tonewood staples once considered inexhaustible - like mahogany, rosewood and maple - continue to diminish. Market prices for these commodities continue to soar. There are no secret sources left. Forests throughout the world have been thoroughly tapped. Does this mean we’ll all be buying vintage or playing some sort of composite vegan guitar in the 21st century? To get closer to the answer, we talked to a tonewood supplier, a small scale luthier and none other than Bob Taylor himself. Environmental activists have long advocated for greater protection of tonewood supplies. It seems that lawmakers are now serious about protecting what’s left, too. You may remember when the US Fish and Wildlife Service raided a Gibson warehouse in 2009 (and again in 2011) after discovering illegally imported ebony from Madagascar. Those officers came a-knockin’ courtesy of the Lacey Act. Originally written into US law in 1900 to prevent illegal wildlife trafficking, it was amended in 2008 to include plant products such as paper and timber. This means that companies in the US are required to import only legally harvested wood, regardless of enforcement or corruption in the producing country. The Lacey Act was signed into law in 1900 in the United States to ban illegal wildlife trafficking. In 2008 the act was amended to include plant products such as paper and timber, requiring guitar manufacturers to import only legally harvested tonewood. The Convention on International Trade in Endangered Species (aka CITES) is a legally binding agreement among participating countries that’s been in play since 1975. This is a wide-ranging protection that applies to over 35,000 species of plants and animals. It doesn’t overwrite national law, but it still impacts tonewood trade as certain supplies diminish. The Convention on International Trade in Endangered Species (aka CITES) is an international agreement enacted in 1975 that protects over 35,000 species of plants and animals. While it doesn’t supercede national law, it is legally binding for the countries that opt in. The making of guitars and other wooden instruments doesn’t even represent a significant portion of the global demand for timber. Most wood goes to construction, fuel and pulp products. It’s the number (over 200) of species - not the volume of wood - needed for making instruments that creates problems. Tradition dictates that you can’t build a guitar or a violin out of just any wood. The mahogany, rosewood and ebony we value for guitars often grow in solitary patches, forcing loggers to clear surrounding forest first to access the tonewood. The focus on old growth wood, prized for its resonance and character, is also inherently unsustainable. There’s only one way to get it: let trees stand for decades without harvesting them. At some point the party is going to be over. In the meantime, the regulations put in place to protect ecosystems and biodiversity are bogging down what was once a straightforward supply chain. Suppliers are forced to meticulously document the botanical genetics and provenance of the woods sold. The paper trail must be legitimate through the worldwide supply chain. These necessary steps for compliance cost money. Chris Herrod of Luthiers Mercantile International has taken a particularly strong interest in this topic. LMI has been distributing luthier woods for decades to a broad spectrum of builders. It has witnessed a dramatic shift in tonewood supply in just the last five years. “We have seen increases in our advertised retail sales prices for much of our wood parts," Herrod explains. Costs on mahogany and alder body blanks, as well as rosewood acoustic sets, have risen upwards of 30%. Choice ebony fingerboard material is up by nearly 75%. “Keep in mind here that our margins have not increased. In many cases they’re less than they were five years ago," Herrod adds. Much of this is due to restrictions and enforcement. LMI is extremely committed to thorough documentation and maintaining the integrity of its products. This includes procuring crucial certifications from organizations like the Forest Stewardship Council like its SmartWood seal. As Herrod explains: “Now Brazilian rosewood (Dalbergia nigra) is on the same level of ivory and tortoise shell. We stopped carrying it years ago while others have turned a blind eye." Now Brazilian rosewood is on the same level of ivory and tortoise shell. We stopped carrying it years ago while others have turned a blind eye. The Rosewood trade in India is also tightly controlled under CITES II regulation, but the outlook is more positive. “Forest harvest is rare, but the quality of plantation wood is basically good. It should remain available for the foreseeable future." Here Herrod is referring to the use of timber cultivated specifically for harvesting rather than using trees from naturally grown forests. Genuine mahogany (Swietenia sp.) from Central America also remains in use under CITES II protections, but the long term future is uncertain. "Most of the large, old-growth trees have vanished and, once again, we face a dramatic decrease in quality and increase in price." Even species like figured European maple (Acer pseudoplatanus) and old growth Sitka spruce (Picea sitchensis) are rapidly disappearing. Most of the North American species that luthiers regularly use - redwood, koa, walnut - are not strictly endangered as a whole, but the large, old-growth trees among them have been over-harvested and pushed to the brink. It may take upwards of 80 to 100 years for these trees to reach the maturity necessary to harvest at the quality desired to craft instruments. 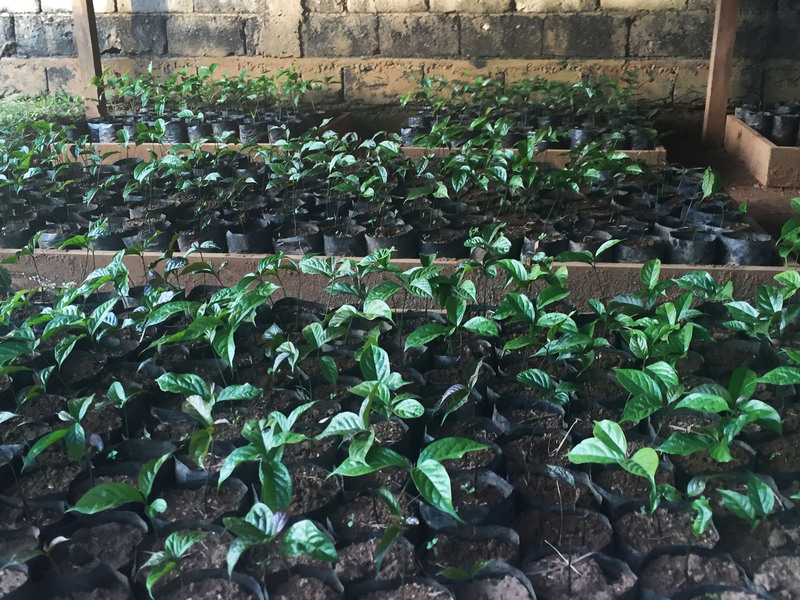 LMI aims to provide as many “new" varieties they can find to offer alternatives to the classics while educating the customer base along the way. Ebony and mahogany substitutes, for instance, are making their way into the mainstream. “Now the market accepts striped and colored ebony in order to make use of this wood’s other fine qualities (hardness, machinability)," Herrod says. Khaya (Khaya senegalensis) is similar to genuine mahogany and the easiest to work with, but others like sapele and Spanish cedar are gaining acceptance too. Katalox (Swartzia cubensis), used as a resonant fingerboard material, is a dark hardwood with an ample supply of trees that is well monitored and certified. Although the outlook for traditional rosewood, mahogany, and ebony might be bleak, Herrod is confident that the community will adapt to a wider range of options as more and more builders experiment and learn about the massive potential of alternative materials. Luthier Perry Ormsby of Ormsby Guitars works from Perth, Australia. He has a unique perspective on the cost of tonewood. As a small builder outside the United States, Ormsby has to import virtually all of his supplies. Few of the staples, aside from rock maple and Tasmanian blackwood, are readily available domestically, forcing Ormsby to constantly navigate the elaborate import/export game. When asked about his experiences, Ormsby is quick to break down the numbers. Ormsby uses simple swamp ash (Fraxinus sp.) as an example. Since he is not able to import a piece of lumber, it must be ordered in the form of a body blank. Simple planks might cost around $60 in the United States, but a body blank runs $100 to $120 USD. Ormsby will generally buy four at a time which ends up being $760 USD with shipping costs, or $1100 AUS. Because it's over a $1000 threshold, the shipment requires a $59 AUS import duty form with an 10% GST plus 5% import tax, totaling about $1350 AUS. Now that his company has more buying power, he’s graduated to importing full pallets of swamp ash material from larger suppliers (the same one Fender uses). Getting larger loads can take months, but it gets the cost down to around $46 USD per body blank. Every single piece of wood has to be documented with proper forms for the specific countries it moves through. This makes the whole process rather intimidating for a new luthier. Even shell inlays that make up the dots on the neck need documentation. Every single natural element on the guitar requires paperwork and inspection, which raises costs on the raw materials that go into a high-end instrument build. All this cost is incurred before these pieces are even processed or assembled in the shop. When asked how wood affects his clientele’s choices Ormsby says, “People choose the woods that they want. Things like Pale Moon Ebony. Something you’ve spent $350 on and you can get two fretboards out of it. It’s gotta sit there for six months. Sometimes it will split and it’s shrunk." This adds to the cost. Ormsby had the foresight to stockpile Honduran mahogany (Swietenia macrophylla) before legislation even took effect, but says he rarely gets requests for it. Using Tasmanian blackwood (Acacia melanoxylon) as a substitution has been a game changer. “A close cousin to Hawaiian Koa, it is heavier than mahogany and difficult to work with, but it sounds great. It looks cool, and it’s Aussie," Ormsby says. 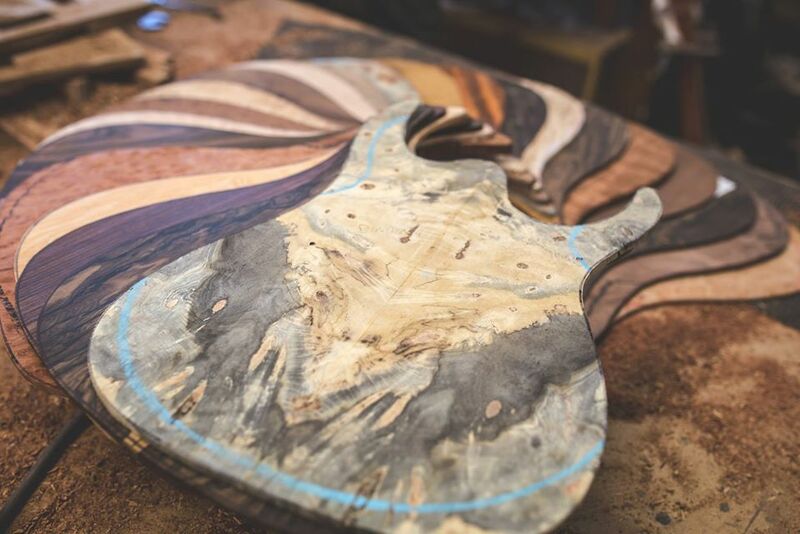 When his customers are educated about the wide range of wood possibilities he is using and and see the results, it makes them rethink everything they wanted out of their dream guitar. Substitutions for traditional fretboard material are readily put to use in his builds. Wenge (Millettia laurentii), Pau Ferro (Machaerium scleroxylon) and Pale Moon Ebony (Diospyros malabarica) are favorites. Ormsby has even used Richlite - a FSC® certified product made from post consumer recycled paper - for fretboards. It can be processed and prepared in a manner that creates a look of deep black Ebony. It is a resilient and durable material that easy to work with and feels great. As long as the material is acoustically resonant and has great aesthetic value, Ormsby will find a place for it in his very unique instruments. Bob Taylor of Taylor Guitars is perhaps the best example of how scarcity and policy are changing the economic landscape of guitar manufacturing. Taylor had the foresight to recognize a supply issue years ago. He’s taken far-reaching actions to ensure that these precious woods remain viable, not just for them, but for the industry as a whole. “First, let me say that costs have always risen. When have costs not risen?" Taylor asks. “When the wood is in rare supply, the price goes up. Nearly all our woods have probably increased in price about 15% over the last few years. I don't blame this on regulation. I blame it on supply. But since the supply is so low, it's also become highly regulated to the point of illegality." Nearly all our woods have probably increased in price about 15% over the last few years. I don't blame this on regulation. I blame it on supply." Taylor provides an example to illustrate more clearly. “We buy mahogany, which is listed on CITES III, and so we need CITES permits to bring it in. The wood comes to El Cajon, California, where we make neck blanks," he says. “Since the neck blank is a 'guitar part' and not a piece of lumber, it can travel CITES-free into Mexico. But the leftover pieces have to get sawn into pieces of wood that we use to make internal parts for guitars [made in Mexico]. Now it becomes very difficult to not mix wood from different countries into one container shipment. So that means we can't send it into Mexico, because they don't consider these blanks we make as being a part." Taylor adds, “Otherwise, we have to throw it away. The unintended consequences of good-intentioned regulation." There was an era when you could just take the wood, but that time is over. Taylor recognized an imminent issue with the supply of African ebony (Diospyros crassiflora). So in 2011, through a partnership with spanish supplier Madinter, they procured an ebony mill in Cameroon that has the highest permitted quota of harvest in the entire region. This has positioned them as one of the largest distributors of luthier grade ebony in the world. “I can say that to operate a company in Cameroon totally and completely legally - and then add ethics and sustainability to that - costs a lot of money. We compete against people who don't do that." Taylor has also started a company called Paniolo Tonewoods, a partnership with Pacific Rim Tonewoods. Together they are undertaking a massive planting of Koa (Acacia koa) timber in Hawaii. These ventures are aimed at keeping beautiful woods around for generations, making them cost effective and available to everyone for a long, long time. “Some of our inspiration for this comes from using mahogany from Fiji that the British planted there 80 years ago. Again, someone did it, and I am following their example." 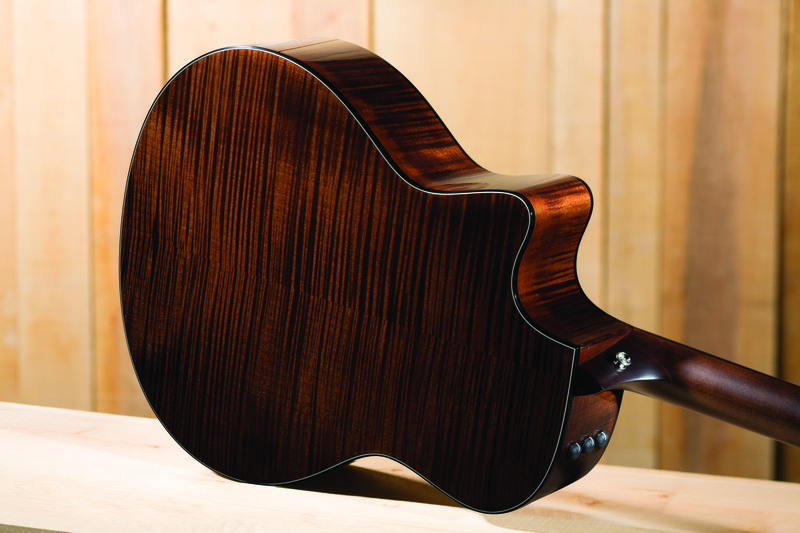 Pick up a Taylor brochure and you will see the breadth of materials they put to use in their guitars. They have popularized the use of sapele (Entandrophragma cylindricum) for over 16 years as a substitute for traditional mahogany, and the demand has not slowed. Spanish cedar (Cedrela odorata) is also a favorite substitution for traditional mahogany. They've also embraced Tasmanian blackwood for its tonality and brilliant look. 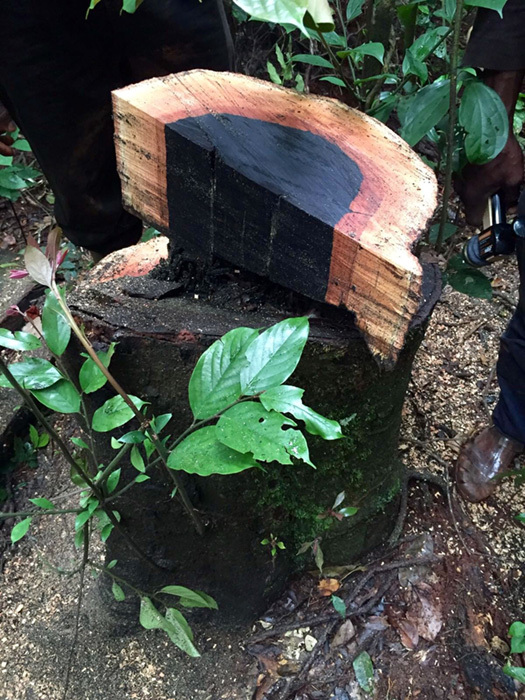 Taylor has also started doing really interesting things with Cameroonian ebony (Diospyros crassiflora hiern) and plans to use more of it for backs and sides. “It makes wonderful guitars. People are going to just love striped ebony used in that way." Ultimately, it's about making high-quality instruments that stand the test of time. Not producing a disposable commodity. This in and of itself is an act of sustainability that can maintain our precious wood supply for the future. But it’s still hard to shake the feeling that a change is in the air. The wood combinations of yesterday will inevitably give way to substitute woods or composites. People will yap about the good ol’ days while a new generation of guitarists drowns them out, happily making new music on new instruments. If this sounds like a doomsday scenario to you, look at the wealth of used and vintage guitars on the market. The craft and care that went into their construction means one more instrument available to a contemporary player, and one less bounty of wood that needs to be removed from a precious forest.